Wow, Bebe Cool's wife, Zuena Kirema, is pregnant. The baby bump was spotted over the weekend during the Kayla car wash. Kayla is the little girl with complications with her brain, over shs 180M is required for her operation in India. 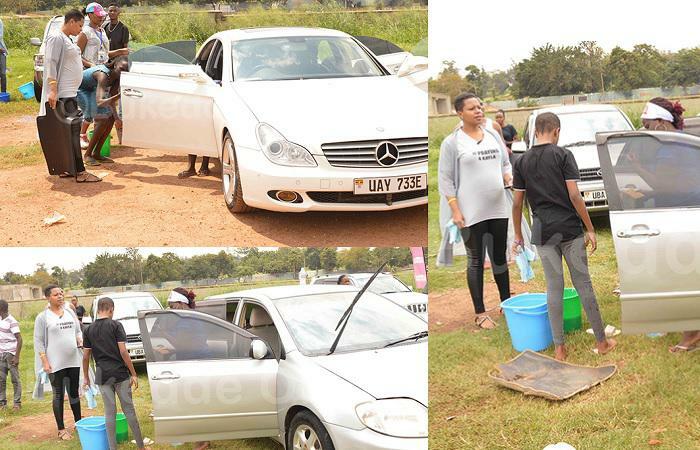 Zuena and her daughter, Beata were busy washing cars and among the rides was her birthday gift, a silver Mercedes UAY series that her hubby, Bebe Cool, gave her as a valentine's gift. The search for the E name is already underway and all the family members have all come up with name suggestions including their last born, Caysan. The Bebe Cool's have maintained the alphabetical order names for their children. This will be Zuena's fifth and Bebe Cool's sixth. The Nkola Byafayo singer's first born from an earlier relationship is aged 22 going by his real name Allan Brian Ssaali aka Hendrik.